Rudyard Kipling, who wrote the original novels the film is based on, called Baloo “the sleepy brown bear”. You can see why they cast comedy giant Bill Murray, then, a man whose ability to be very funny and very laid back has made him a household name. Top tip: you’re probably best off not mentioning his Garfield movies next time you see him. Sure, he played a similarly chilled-out animal – only instead of eating “fancy ants”, he ate lasagne – but Rotten Tomatoes doesn’t lie. 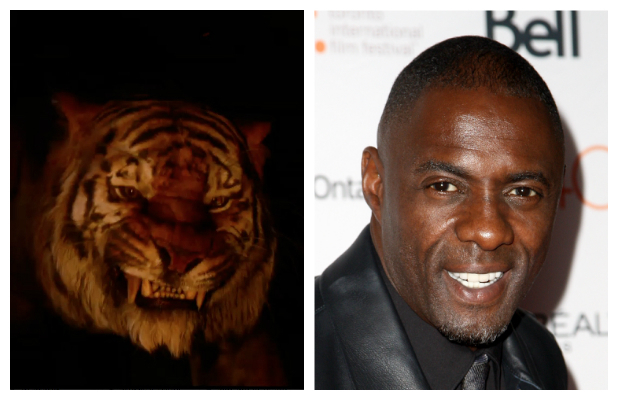 In the original stories, Shere Khan was born with a crippled leg, though by the looks of this first trailer, Idris Elba’s take on the self-professed ruler of the jungle doesn’t have that problem, scrapping with Bagheera and leaping around with ease. Best known for his work on the Thormovies, The Wire and Luther, Elba and his cavernous tones have only recently been enjoying attention from Hollywood’s voice casting agents. His name has also cropped up on the cast list for Pixar’s Finding Dory in an as-yet unannounced role. 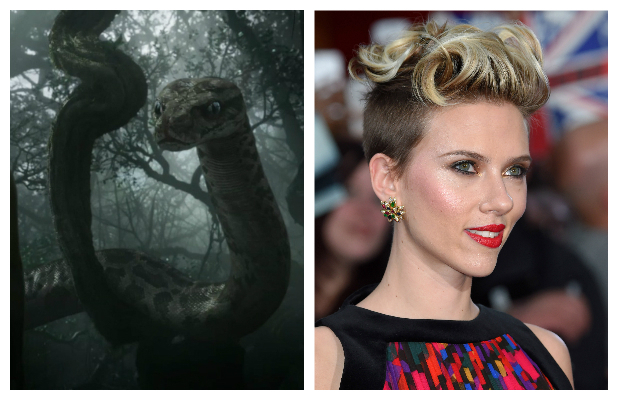 Kaa is meant to be “a hundred years old and still in his prime”, according to the books, though KaaJo – sorry, ScarJo – doesn’t sound a day over 30. The Avengers veteran recently garnered critical acclaim for her voice work on Spike Jonze’s Her, where she played a… complicatedartificial intelligence that falls in love with Joaquin Phoenix’s impossibly-named Theodore Twombly. Her previous role as the voice of Princess Mindy in The SpongeBob SquarePants Movie probably didn’t help her with this new villain gig, incidentally. 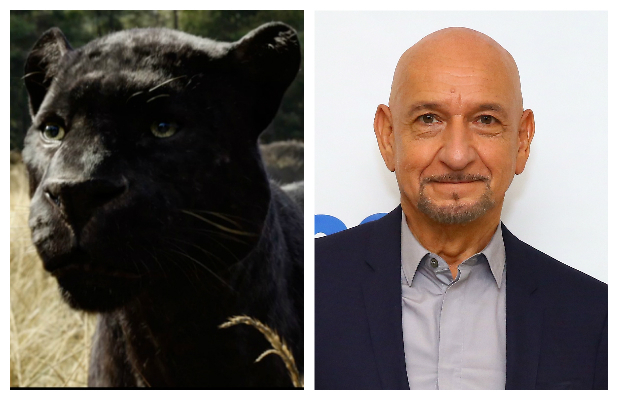 To do the character justice, Jon Favreau needed an actor with a “voice as soft as wild honey dripping from a tree”, so Ben Kingsley seems like an excellent choice indeed. You need someone whose dulcet tones can do clever, serious, and responsible for wise ol’ Bagheera – and remember, this is the guy who played Guru Tugginmypudha in Mike Myers’ The Love Guru. Oh, and Gandhi. King Louie does not appear in Rudyard Kipling’s original books, as orangutans are not native to India, so this character is a bona fide Disney original. 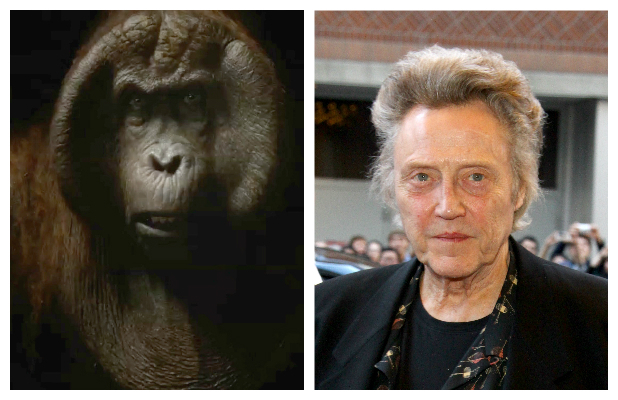 Fortunately, so is Christopher Walken, with his voice almost nothing like anyone else’s voice in the history of the world, ever. Perhaps the best example of Walken using his voice for dramatic effect is his “gold watch” speech from Pulp Fiction – though if he delivers that to Mowgli in The Jungle Book, we’re leaving the cinema straight away. The Jungle Book hits UK cinemas on April 15, 2016. 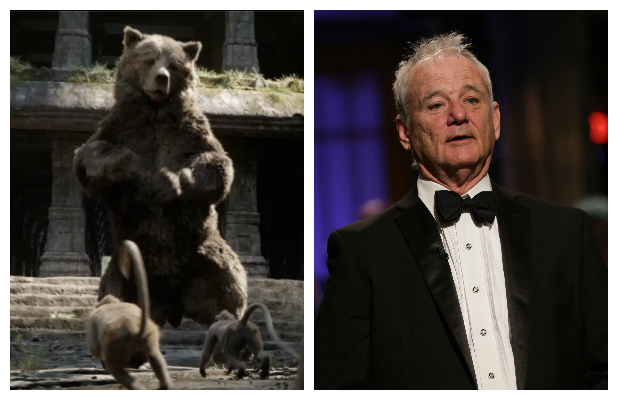 Warner Bros’ rival production, The Jungle Book: Origins, meanwhile, comes out on October 6, 2017.